I love Sri Lanka today. Visited briefly back in 2001 during dark days of the civil war. Was not enthralled. 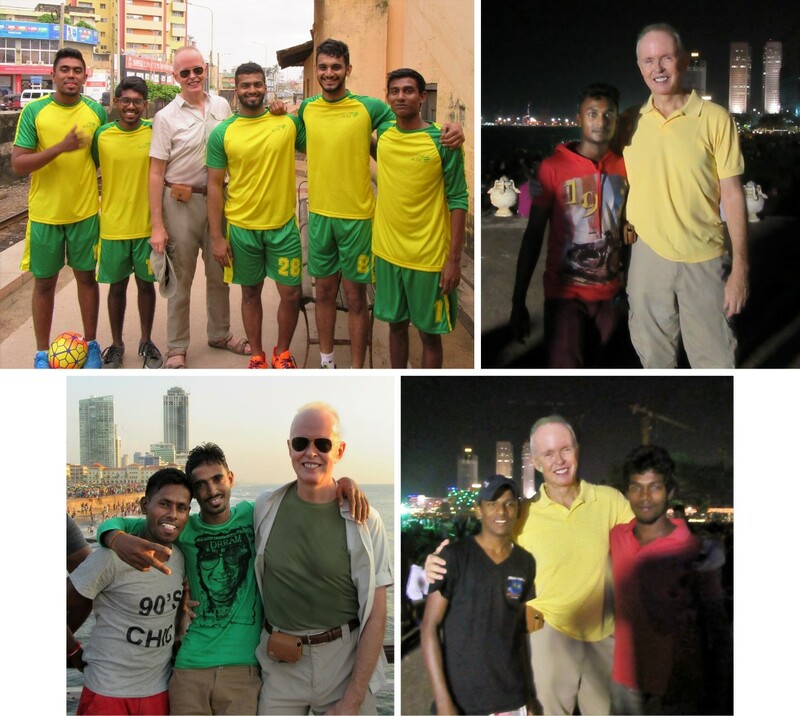 British Tim urged me to check out peaceful, prosperous, postwar Sri Lanka and he was right. It is indeed, as he'd say, "splendid." Upon landing on New Year's Eve, the local headline was that Condé Nast Traveller had just named Sri Lanka one of the world's two best places to visit for 2016: "affordable, uncrowded, and relatively unexplored," and "undergoing a cosmopolitan change." Galle Face Green is a big, open, ocean-side area, nearly a mile long, in the heart of Colombo. On weekends Galle Face is crowded until late evening with friendly, good-spirited locals and small sprinkling of tourists. Many kites are flown. Concerts or cricket games might be held. Teenagers and families play on the small beach too. Food stalls line the strip. First photo above shows south part of Galle Face; left photo shows to the north. Note all new buildings nearby. Always fun when locals want a photo with the visiting Martian. I take so many pics of people overseas that I'm always happy and honored to reciprocate. Walking solo especially along Galle Face (and elsewhere) prompted quite a few invitations and I usually requested a swap. Here are a few above. 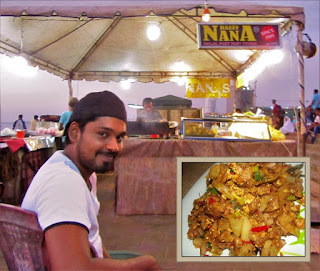 Kottu is a spicy Sri Lankan stir-fry of shredded roti bread with vegetables, with options to add eggs, meat, cheese. 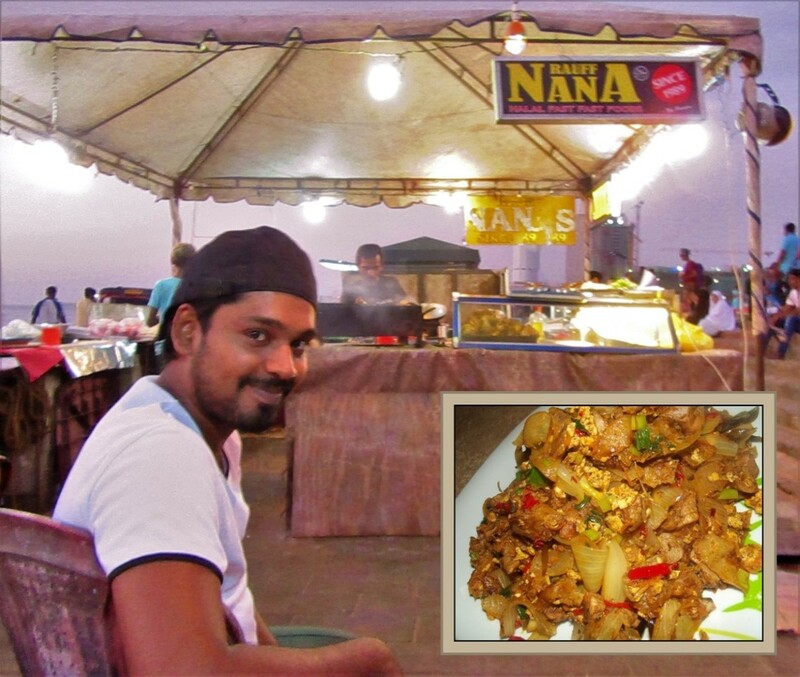 On the left is the nice owner of my favorite place to get kottu at Galle Face. 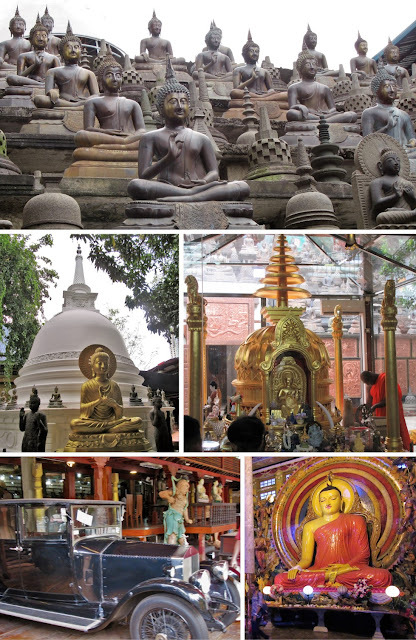 The mellow Buddhist culture called for a visit to Gangaramaya Temple, said to be the most important place of worship for Buddhists in Sri Lanka. One of the curiosities in Gangaramaya's buildings was the collection of more than a half dozen vintage cars. I was never able to get an authoritative explanation for their spiritual significance. While I received some sweet, shy smiles, never once did women in colorful, flowing saris ask for a photo. And they seemed much too elegant to be approached by a perspiring tourist in khaki shorts and sandals. So I'm left with memories and the above blurry, drive-by photo shot from my speeding tuk-tuk. 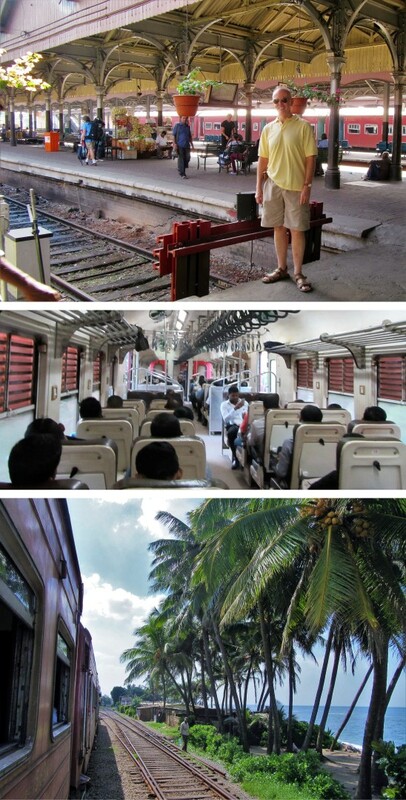 Enjoyable two-hour train trip along the coast from Colombo down to Galle. Fancy, first-class, tourist trains are available but I was on a simple second-class car on a regular express train. My car on the crowded, early-morning return train seemed to be filled with lots of commuter friends; many people had to stand; lots of people offered me sugary treats; and it was one big happy party all the way to Colombo. One part of the walls around the very large old Dutch fort in Galle. 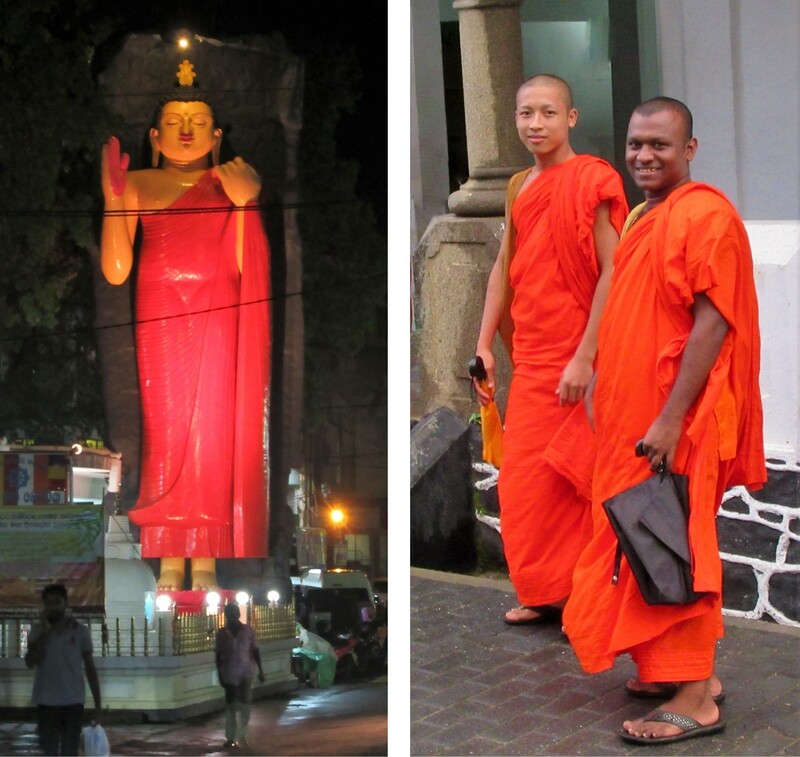 A large Buddha in a Galle traffic circle and two monks in Galle (one from Cambodia). One obligatory beach photo, but did not fry out on any of the pretty beaches. In 2009, Sri Lanka's military on behalf of the large majority Sinhalese (Sinhala-speaking, mostly Buddhists) decisively defeated the Tamil Tigers (Tamil-speaking Hindus) in the north after 26-year long civil war. Reconciliation efforts are still underway but peace has unleashed boom times and is bringing in tourists, but so far, happily, not in overwhelming numbers. It is remarkable to me that spillover from neighboring India ― with over 60 times as many people! 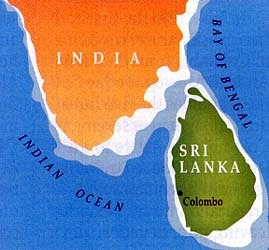 ― has not obliterated the Sri Lankan culture. India has been influential of course, but Hinduism for example never supplanted Buddhism here, even if a few Hindu deities did slip into a few Buddhist temple carvings. While not rich, Sri Lanka is noticeably more affluent than India, and has far lower rates of severe poverty. around Galle Face on New Year's Eve. 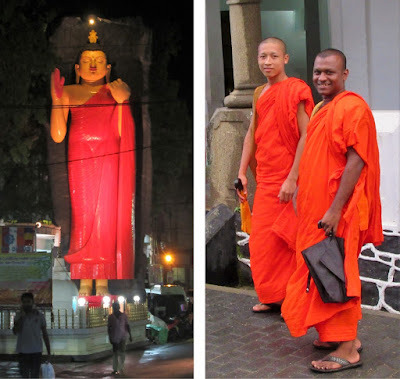 "...there isn't much to do in Galle, but that's true of all Sri Lanka. I think you go there for the climate and the people and the sense of wellbeing it gives you. There is some surfing on the east and south coasts, there are good walks, and temples in Kandy and elsewhere, but it's more of a place to talk and dream and eat." I have to agree. Sri Lanka lacks a Taj Mahal or Angkor Wat. It has no Iguassu Falls or Amazon. But, it is such a warm, clean, hospitable, tropical island that its charm and low-key delights more than compensate.